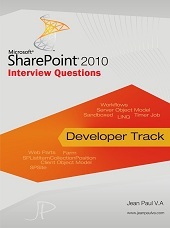 In this article I would like to take you through the Document Set feature of SharePoint 2013. Document Sets are a feature in SharePoint Server 2013 that enables an organization to manage a single deliverable, or work product, which can include multiple documents or files. Simply, you can see it as a collection of documents packed together. While working with Document Libraries, you can upload Document Set instead of a single Document. A Document Set can contain multiple documents having same columns as the document library. How to enable Document Set? Open your site, then Site Settings page. Click on the Site collection features link, you will get the page below. Click on the Activate button corresponding to Document Sets feature. Wait for a while for the activation operation to complete. Document Set is enabled for a library by Enabling Document Set content type. Create a new library, Choose the library settings, Advanced Settings & enable the following option. Save changes & go back to the Library Settings. From the content types section, choose the Add option. In the appearing page, add the Document Set content type & save changes. Now you are ready with multiple content types for your document library. Open the document library & choose the FILES tab, select the New Document Set context menu. In the appearing dialog box, enter the name of the Document Set, you can upload documents later. Saving changes will take you to the next screen for adding documents. Here you can add multiple documents for the same document set . Please note that the upload screen says Document Set as “Folder”. As shown below, you can see that the multiple documents exist in the same document set. Plus, the document library columns are available for the child documents as well. This concludes our usage with Document Set. Under the hood, Document Set can be considered as a Folder. In this article we have explored the Document Set feature of SharePoint 2013, Activating, Enabling & Creating a document set. Error :: The Taxonomy feature has not been activated. The feature is not activated & it is a hidden-feature. Activate the feature at site level using PowerShell.